The focus was heavily slanted on the future for the Baltimore Ravens in terms of coverage this offseason, especially after they drafted quarterback Lamar Jackson out of Louisville at the end of the first round of the 2018 NFL Draft. The Ravens themselves though were very much looking at the present too. After a heavy defensive draft in 2017, they used two early selections on tight ends and replaced the top three wide receivers on their depth chart with free agent additions. If this Sunday’s win over the Buffalo Bills was anything to go by, that focus on adding playmakers for quarterback Joe Flacco is something that looks to be paying off. So what was it about Flacco’s performance that was so impressive on Sunday? We wrote during the preseason about how Flacco had impressed for the Ravens, and on how the perception of his struggles in 2017 didn’t really give enough credence to the fact that he dealt with a back injury in the first half of the year. If you look at the second half of the season, the Ravens signal-caller was the 11th-highest graded quarterback in the league. We saw more of the same in the preseason, where Flacco was our ninth-highest graded quarterback. Considering both of those facts, it really shouldn’t be a surprise that Flacco opened the season with an impressive performance. He was our third-highest graded player at the position this week, with only Ryan Fitzpatrick and Drew Brees grading higher than Flacco, who came in at 86.8. While one of the biggest criticisms of the Ravens offense last season was that they were too conservative, that wasn’t the case on Sunday, with 10 of Flacco’s passing attempts traveling 10 or more yards downfield, including going 2-for-2 for 41 yards and a touchdown on throws 20-plus yards in the air. On those throws of 10-plus yards or longer, he produced a PFF passing grade of 91.2, which ranked fifth among quarterbacks this week. 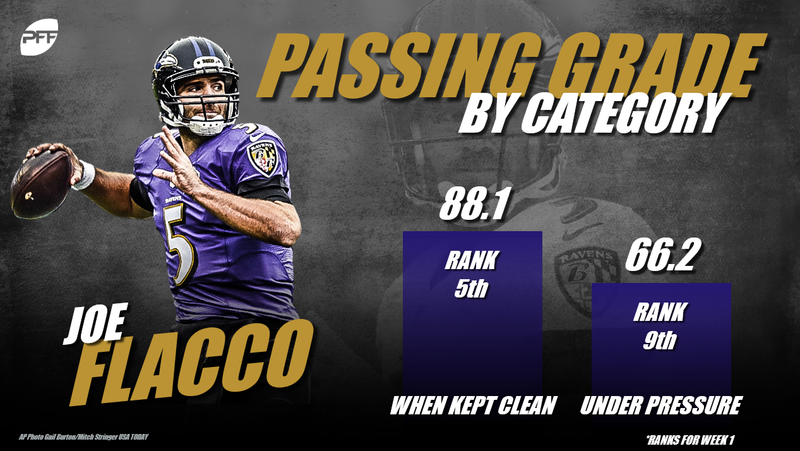 Keeping Flacco free from pressure was key too, and the Ravens were able to do that successfully for most of the game, as he was kept clean on 29 of his 35 dropbacks. Left tackle Ronnie Stanley, a player whose development will be key for the Ravens this year, allowed just one total pressure over the course of the game. On those plays, Flacco produced an adjusted completion percentage of 88.9 percent and a PFF passing grade of 88.1. It’s about more than just Flacco though, this was a performance that highlighted the success, so far, in the Ravens adding weapons on offense this offseason. First-round draft pick Hayden Hurst is out injured but third-round tight end Mark Andrews caught all three catchable passes thrown his way for 31 yards and two first downs. Willie Snead, John Brown and Michael Crabtree all caught at least three passes and a touchdown each. This was a game that saw seven different offensive players see three or more targets. The Ravens added help for Flacco this spring, and so far he’s putting it to good use. The Ravens will see tougher tests in 2018, starting with a trip to Cincinnati to take on the Bengals on Thursday Night Football this week, but this was the start they were hoping for and more.